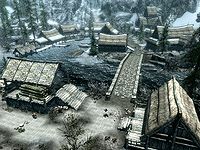 Morthal's small population and relatively remote location have kept it distant from most major conflicts in its history. The citizens of Morthal are known to be reclusive and cautious of outsiders. Many alchemists travel to Morthal and its surrounding marshes to make use of the plethora of rare and useful ingredients available. Residents of Morthal have passed down the legend of the Pale Lady for untold years. They tell of a dangerous ghost woman who prowls the marshes to the north of town seeking her lost daughter, who is thought to be linked to "Aumriel" (mentioned in ancient records as a foe defeated by the descendants of Ysgramor).